RETIREMENT homes can be depressing places, but Starcastle comes as a pleasant surprise. This upmarket development for pensioners in Shanghai is a joint venture between Fosun Group, a Chinese conglomerate, and Fortress Investment Group, an American private-equity firm. Visitors find a colourfully decorated apartment building filled with energetic oldies. By the entrance, a giggling gaggle admires the herbs and flowers; nearby, residents practise tai chi and calligraphy; others are in a classroom, learning to use WeChat, a mobile-messaging app. The Starcastle venture illustrates the long-standing strategy behind Fosun’s transformation from an entrepreneurial startup into China’s largest private-sector conglomerate. Put simply, the firm has been brilliant at trend-spotting, catching successive waves of economic growth in China at just the right moment. 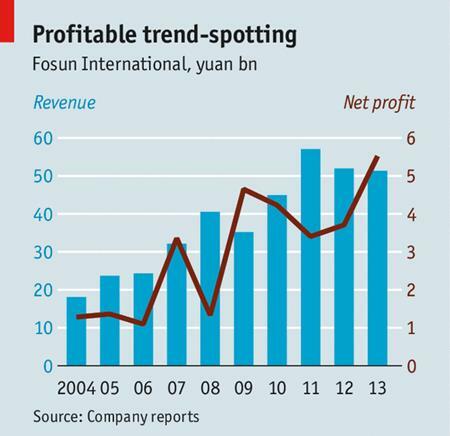 Fosun’s revenues exceeded 50 billion yuan ($8.3 billion) last year; its profits rose by half to 5.5 billion yuan (see chart). Two decades ago, four graduates of Fudan University in Shanghai pooled about $4,000-worth of yuan to form Fosun. First, they applied their quantitative skills to market research, helping the peddlers of such things as moon cakes. Their rigorous methods helped them earn 1m yuan in six months, but they learned a painful lesson about intellectual property. “Chinese are too smart and too hard-working, so if they see anyone making money others will copy,” explains Liang Xinjun, one of the founders and the current chief executive. So the young entrepreneurs decided to plough their earnings and energies instead into capitalising on China’s continuing economic liberalisation. The drugs industry was strictly controlled at the time, but diagnostics kits using the new technologies of gene sequencing were not yet regulated. The Fudan four grabbed the opening. By 1994 their sales of the kits were approaching 40m yuan. In 1996, when private firms were first allowed to enter drugs manufacturing, they jumped in. In 1999, when drugs wholesaling opened up, Fosun expanded again. That potted history explains why Fosun’s assets look like a ragbag. However, its management is determined to transform the firm from an industrial conglomerate into an insurance-oriented financial firm with long-term investments in consumer-facing, services-oriented businesses selling to China’s rising middle classes. Why insurance? The Fosun four are inspired by Berkshire Hathaway’s use of the “float” money generated from premiums to pay for long-term investments. Fosun has been expanding rapidly into the business. It has a joint venture in China with Prudential Financial, an American life insurer, and is currently pursuing LIG, a South Korean insurer. Rather than going it alone into unfamiliar consumer businesses, Fosun is bringing world-leading brands to China. Starting in 2010, when it invested in Club Med of France so as to bring its all-inclusive holiday resorts to China, it has gone on an acquisition spree. As Western asset values plunged in the wake of the global financial crisis, the firm developed a “target matrix of 200 to 300 firms”; it has looked into about 100 so far. Foreign firms often find China hard to crack, so they may welcome having a well-connected and wealthy local partner like Fosun. Mainlanders are now the biggest force in global tourism, but in the past had few upmarket offerings to choose from. To serve Chinese families seeking novel holidays, Fosun is spending 10 billion yuan to bring Atlantis, a water-themed resort, to the Chinese island of Hainan in partnership with Kerzner International of South Africa. It is also engaged in a battle to take full control of Club Med. Aside from tourism and elderly care, Fosun is also making big bets in fashion, beauty and health care. It has invested in Folli Follie, a Greek fashion retailer, so it can reach the mainland’s increasing numbers of style-conscious youngsters. It acquired Alma Lasers of Israel, which makes technology for cosmetic enhancement, to cater to the booming beauty market. It is said to be pursuing Healthscope, an Australian hospital operator, so it can expand high-end medical care in China’s cities. The firm is also pursuing the mobile internet, where China is a leader. It is developing a car-insurance policy to be sold on mobiles. It has a tie-up with an arm of Alibaba, a local internet giant making a big push into mobile banking, which provides microloans to small businesses. And it has various private-equity investments in firms offering “online-to-offline” services (such as apps that lure smartphone users to nearby physical businesses). Will Fosun’s dream of becoming the next Berkshire Hathaway, propelled by the lifestyles of China’s new middle classes, come to fruition? Things have gone well so far, but there are grounds for worry. One is that economic growth may stall, dragging down middle-class aspirations with it. Another is that the government may fail to relax its tight regulation of elderly care, and therefore that profits from this business remain elusive. Even so, Fosun’s bet seems reasonable. The McKinsey Global Institute, a think-tank, has calculated which of the world’s cities will have the largest populations of rich wrinklies in future. Shanghai and Beijing are the leaders, and five of the top ten cities are in China.